Active managers try to outperform their benchmark through various active bets. They obviously need to be skilled in order to be successful. But skill is not the only possible driver of active bets. Some will be the result of biases. As investors, we need to be able to untangle the impact of skill – alpha – from that of other factors that contribute to active return. I start with the easiest case: portfolios that focus on a single asset class. To simplify the analysis even further, I assume for the time being that the portfolio remains always fully invested (we shall return to the question of market timing in a subsequent post). Let us assume that we want to review the performance of two active global equity managers whom we hired some three years ago. Manager A achieved a return of 17 percent per annum for the three years to the end of April 2012. The MSCI World index, which serves as the portfolio’s benchmark, returned 15.6 percent for the same period (net in USD). Manager A has obviously outperformed the index and will be eager to call the difference alpha and insist that it is due entirely to his superior skill. Manager B achieved a return of 14 percent over the same period and against the same benchmark. Manager B will be rather less eager to have his performance interpreted as evidence of lack of skill and will instead offer a range of alternative explanations. But without further information about the structure of the two portfolios, we cannot determine unambiguously whether manager A really did a better job than manager B. As an illustration of what kind of factors might have contributed to the managers’ returns, consider the chart below. 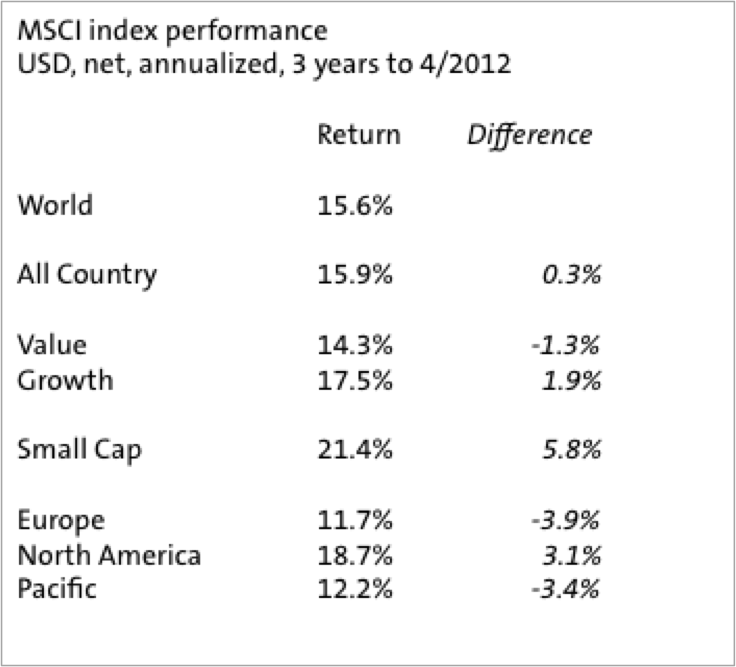 It shows the annualized returns of a selection of style benchmarks over the past three years. Clearly, style or regional biases might have had a major impact on performance over this period. If manager A had had a strong small cap bias, his 17 percent return would have been less than impressive. On the other hand, a regional bias away from North America might explain most or all of manager B’s underperformance. Thus, to make any meaningful statements about the true value added by the two managers, we have to determine the impact of factors other than skill that may have contributed to their performance. In particular, we need to identify any persistent biases that may exist in the two portfolios. In active equity portfolios, managers seek to add value through stock selection, sectoral and regional allocation decisions and by varying their exposure to the various risk and style factors – beta risk, value/growth, size and momentum. As mentioned earlier, we ignore timing decisions. These decisions are presumably driven by the manager’s investment process. That process may be well formulated, defining in detail how the investment team arrives at its decisions, or it may be just a collection of platitudes that allow the team to do whatever they feel like on any given day. But all processes, regardless of their quality, will contain some undocumented elements: managers do certain things that are not part of their “official” process and they do not do certain other things that are supposedly an integral part of their process. The magnitude of these differences between the official process and the way in which it is implemented is a useful indicator of the quality of the process. The greater the dissonance, the greater the risk of unexpected accidents occurring. Understanding the nature and magnitude of this dissonance must therefore be a crucial objective of any due diligence process in the selection of active managers. In the context of determining the sources of a manager’s active performance, we are particularly interested in persistent style and risk factor biases that are not part of the official process. As an example, one global equity manager I know has overweighted Italy for well over a decade. It has cost him dearly in terms of performance (Italy has underperformed the World index by almost ten percent per annum over the past ten years and even more over the past five years) but I suspect that he will continue with this bias for as long as he will remain active. Most managers exhibit such “unofficial”, persistent biases in their portfolios. Typical examples include a significant value or growth bias relative to the portfolio’s benchmark. Many traditional equity managers also have a mid cap bias in their portfolios, typically caused by a tendency to roughly equally-weight the portfolio. Similarly, some managers tend to buy stocks that have recently done well, introducing a significant momentum bias into the portfolio. Yet others display a persistent sector bias that may lead to high or low beta portfolios. There is nothing inherently wrong with managers who show a style bias. Such biases are almost unavoidable in a judgmental investment process. But investors ought to be aware of them to assess their likely impact on performance and to avoid surprises. Note that we are interested in the biases relative to the official style of a portfolio. As an example, a value manager who manages relative to a value benchmark does not exhibit a style bias. We are also only interested in persistant biases. Managers who use style or sector rotation as an explicit, disclosed part of their approach are seeking to generate alpha. Of course, a style or sector rotator may still exhibit a persistent bias in some direction or other. How can we find out what biases are present in a portfolio? Most managers will be somewhat reluctant to discuss any style and risk factor biases (some may actually not know, most others will not want you to know). Institutional investors can obtain much useful information from so-called “style skylines” and other analytical materials that managers may provide. Ideally, we would even want to have access to information about individual holdings of a portfolio but this is not always available. Fortunately, we can use the track record of a product itself to obtain a reasonable idea about the principal biases that are present. Bill Sharpe introduced a feasible methodology for what is sometimes called return-based style analysis in an article written twenty years ago. He proposed regressing the portfolio’s return on the returns of a range of suitable risk and style factor portfolios. If those risk and style factor portfolios are well chosen, they will “explain” a significant part of the performance of the portfolio. The return of the portfolio is then simply interpreted as the return of a portfolio of those risk and style factor portfolios plus a residual. The regression coefficients of the risk and style factor portfolios serve as their portfolio weights. In this analysis, the residual is skill based “alpha”, i.e., alpha is that part of the portfolio return that cannot be “explained” by its exposure to the style or risk factors. Note that the usual caveats apply to this methodology: the results are just estimates, the identification of the relevant risk factors is sometimes difficult and always somewhat arbitrary, it is very tempting to use too many of them and thus destroy any significance of the results, the regression period should cover a full economic cycle, etc. Also, as we shall see in a later post when discussing hedge funds, the method works rather less well with asymmetrical return distributions. But for equity portfolios, Sharpe’s approach, applied in a sensible way, can provide us with a fair idea of what biases exist in a given portfolio. 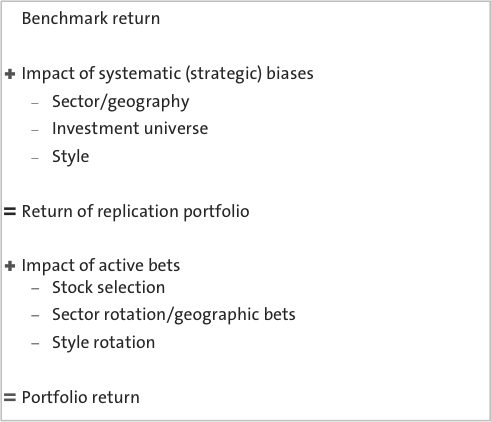 The portfolio that explains the systematic exposures to risk and style factors is often called the replication portfolio since even unskilled investors can construct – replicate – it using standard building blocks. There is a replication portfolio for any active strategy in any asset class, even though some hedge fund managers will loudly deny that fact. Consequently, we define skill based alpha as the difference between portfolio return and replication portfolio return, i.e., that part of the return that cannot be explained by systematic risk and style factors. This differs from the naive definition that defines alpha as the difference between portfolio and benchmark returns; we prefer to call that active return, being the sum of alpha and the persistent risk or style factor returns. What we call skill based alpha also incorporates the effects of good or bad luck; actually in the very short run, random factors may be the major determinant of this “alpha” and lucky fools will sometimes outperform unlucky geniuses over short horizons. However, the important point is that the identification of the replication portfolio allows us to determine all those parts of the return that are clearly not alpha but simply the result of persistent biases. We should seek to identify the replication portfolio of an active product before we invest. If we were to invest in such a product without understanding its true exposure to the various risk and style factors, unpleasant surprises might await us. As an example, one reason why many hedge fund investors were disappointed with their performance in 2008 was that they were blissfully unaware of the fact that the typical hedge fund’s replication portfolio has always included a significant exposure to equities, typically around thirty to forty percent. Some managers will defend their biases by claiming that the selection of well-rewarded biases is a form of alpha. But given that we are talking about long-term, strategic style or risk factor biases, any decision about their inclusion in the portfolio should properly be part of the strategic asset allocation decision. Active managers should focus on tactical bets and not introduce arbitrary strategic biases (and they should never be rewarded for including them). The graph below shows the exposure over time to five style and risk class indices for an active EAFE product. It is sold as a large cap growth product but managed to a core benchmark. While the exposures vary through time, there is a persistent growth bias – as expected – but there is also a small cap bias and a significant exposure to emerging markets that are not disclosed. 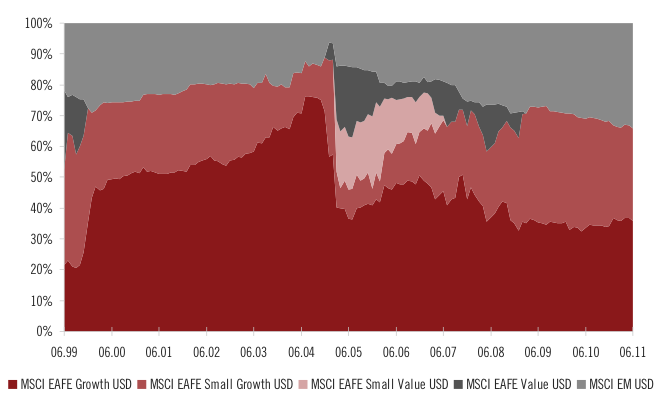 Clearly the replication portfolio of this product is quite different from its official benchmark – the MSCI EAFE Index – since we observe persistent exposure to other styles. An important part of the portfolio’s active performance will have been driven by that exposure. Note that the graph may not show the entire picture; it is quite possible that there were also persistent sector and/or regional biases (which might, of course, be related to the style bias). We could explore these issues through additional tests using sector or regional benchmarks. It might be tempting to run a single regression using a large number of risk and style indices (to the level of, e.g., the MSCI European mid cap value index) to obtain precise results on all imaginable factors. But the statistical reliability of the results of such exercises is unfortunately rather limited – multicollinearity raises its ugly head. The second graph shows the exposure to various style factors of a popular fixed income fund that is managed relative to a global government bond benchmark. 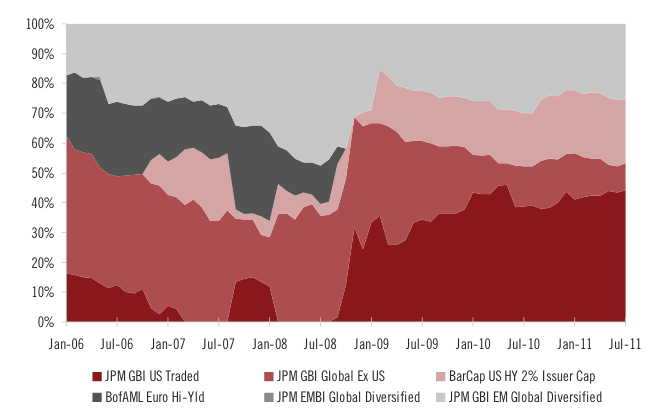 As we can see, on average, only about half of its assets were in bonds that were part of the benchmark (the two dark red segments). Again, much of what the manager will proudly proclaim to have been skill based alpha were simply risk premiums from high yield and emerging market investments. This example illustrates an obvious fact: it is useful to know what we are looking for. There are hundreds of fixed income risk and style factors that we might have used in the regression. But given the earlier comment about the dangers of using too many benchmarks in the regression, we should seek to focus the analysis on the most likely candidates. Naturally, we must have access to data on factor benchmarks and suitable software to generate the kind of results presented in the graphs above. Further information on the practicalities of the return-based style analysis can be found in an old, but still highly useful article from Ibbotson Associates that describes the technique in detail and shows a large number of examples. Equity portfolios are usually more easily analyzed than bond portfolios. Many fixed income products display a considerable amount of optionality, i.e., there are asymmetric return elements, which is difficult to model using simple tools that assume broadly symmetric, normal returns. In order to capture the risk structure of a modern fixed income portfolio in detail, sophisticated risk models such as Riskmetrics need to be used. However, as the second example above shows, regression-based style analysis can still give us a reasonable view of the broad biases in terms of risk classes that a bond portfolio may be subject to. In addition, the standard reporting of fixed income products will usually include rather more useful analytical information (on ratings, maturity buckets, etc.) than the typical equity product does. Finally, it is probably a reasonable starting point for investors to assume that most of the active return of fixed income products is made up of various risk premiums and that alpha represents a rather negligible part. Where do the biases come from? Active management is a tough business and alpha generation is difficult. The temptation for managers to embrace a generous definition of alpha is enormous, particularly where performance fees are involved. The two examples that we looked at above are typical: managers choose a relatively low risk benchmark and then add exposure to higher risk assets – hoping to capture their larger risk premiums, which they then call alpha. Bill Gross of Pimco has been an enthusiastic promoter of this tactic, euphemistically called “core plus” investment. Of course, he considers the resulting performance part of alpha. It would be if the excursions into higher risk assets were tactical in nature (as we shall see in a future post). But they are not: the exposure of these funds to high risk assets is so large that the managers would be unable to eliminate these (often highly illiquid) positions within a reasonable amount of time. But this means that these positions simply seek to harvest risk premiums, which are definitely not alpha. Note that there is nothing illegal or immoral about a core plus strategy. The generous investment universe and the low risk benchmark are usually clearly identified in the product description. Clients are simply encouraged to forget that, under such circumstances, much of the return is likely to come from risk premiums and not from alpha. Should we avoid investing in products that are subject to significant persistant biases? We probably should be careful if the biases are of the idiosyncratic, somewhat irrational kind as in the example about the Italy bias above. Such a manager would need some extraordinary redeeming qualities since that kind of bias is most likely the result of a certain stubbornness and arrogance – not a particularly desirable combination of qualities in an active manager. As far as broader style biases are concerned, they are always a sign of dissonance between the investment process that an investment team has formulated and its implementation. I am quite convinced that discipline and focus are crucial success factors for active managers and am therefore skeptical about the likelihood of success of teams that tolerate the “fuzziness” that results from such biases. As a result, I find managers and products that display minimal persistent style bias among the most promising candidates for active strategies. The chart below summarizes a schematic decomposition of the return of a single asset class benchmark driven portfolio into the risk and style factor driven replication portfolio and alpha. A potentially significant part of of the active performance of a portfolio may not be due to active bets that seek to exploit the manager’s skill but are rather the result of a range of persistent biases. Investors should inform themselves about the nature and magnitude of those biases to avoid unpleasant surprises and also to ensure that the fees charged are commensurate with the skill based alpha component of the portfolio return. The next post in the series will explore alpha generation between asset classes, i.e., market timing decisions and tactical asset allocation.